3) MAGIC AND DRAGON TRAFFICKING AND WAR AND FINDING YOURSELF AND FRIENDSHIP. 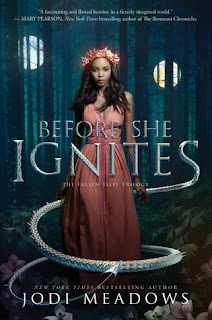 You’ll have to forgive me if most of my review is filled with capital letters because I just finished this book a few hours ago and everything – EVERYTHING, I TELL YOU (but especially the dragons) – about this book made me SO HAPPY. I missed Jodi Meadows’ writing and her way to twist the very world she introduced to you and EVERYTHING. And now I’m gushing, and sad it’s over and waiting desperately for book two. YOU NEED THIS BOOK IN YOUR LIVES. Jodi Meadows’ writing has always taken me by a storm. It’s simple and sophisticated and totally eliminated that time you take to get used to a fantasy world, and allows you to simply slip in and out seamlessly. I loved how Mina was scared and made mistakes but she was pure of heart and her character came alive with the writing. Let’s be honest – in a book with dragons, HOW CAN YOU GO WRONG? This book incorporates a main characters with mental health problems, in love with dragons even though she shouldn’t be and her growth as she learns about the real world locked in a prison underground. It was a gorgeous idea, and written really well and DID I SAY THERE ARFE DRAGONS? WHAT MORE DO YOU NEED? While the idea and writing were really good, I feel like the plot could have been better? The book kept switching from past to present and not in a uniform way which slightly shook me. For a majority of this book, Mina is locked in a dark cell. Everything is done SO SO WELL – from the madness that ensures when she’s locked, the starvation and thirst and the need for human contact and communication and the lists in her head and her hallucinations. Jodi managed to capture the intensity of being a prisoner in harsh conditions very well. I can’t shake the feeling that BSI could have had a LITTLE less time in the prison and a LITTLE MORE out there in the real world, actually advancing the plot. I understand why all of it was essential to her character development but I wish a little more happened as well. The character of Mira Minkoba was BEAUTIFULLY brought out. The peace treaty between the islands was written with her as the ‘Hopebearer’ and all her life she’s been a pretty doll for the ruling council until she speaks up and gets thrown into a prison for life. She suffers from panic attacks, her self-image is in shambles and she’s never had to survive on her own until the prison, and how she grows (slowly but surely) was an amazing journey to witness. ALSO, SHE LOVES DRAGONS AND I LOVE HER. I loved her best friends as well – every good book needs good best friends and she had friends that would risk their lives for her. Mina’s prison cell mates and the evil guards were also done really well. Her relationship with Aaru was one of the highlights of this book – I loved their method of communication, how they bonded and the powers of theirs that we got hints of. I’m very excited to see how everything goes in book two. I LOVED THIS BOOK. It had dragons and mental health and friendship and love and politics and conspiracy and YOU NEED THIS. Another masterpiece from a Queen of Fantasy. 4.5 stars. 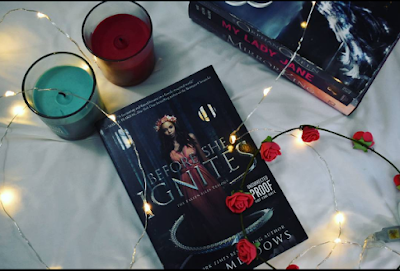 Have you read the AMAZING Jodi Meadows' books? Which one is your favourite? What are your favorite mythical creatures? PLEASE SAY DRAGONS! 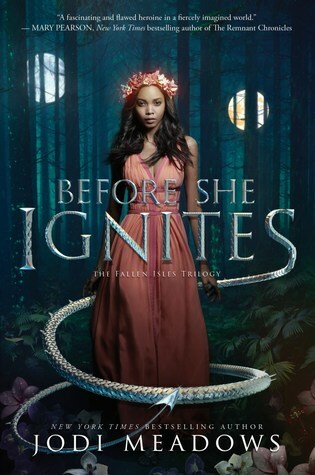 Are you excited for Before She Ignites? Have you already read it!